The expulsion of Yaw Shin Leong, the Member of Parliament for Hougang Single Member Constituency, from the Workers’ Party has once again thrust the issue of the Singapore Government’s policy on by-elections into the limelight. This opinion piece considers whether the Government is right in taking the view that it has wide discretion to determine when, and if, to hold a by-election; and the possible consequences of an existing Non-constituency Member of Parliament (NCMP) standing as a candidate in a by-election. This commentary was first published online at Singaporepubliclaw.com. This version may also be obtained from the Social Sciences Research Network. Jack Tsen-Ta Lee. 28 August 2012. 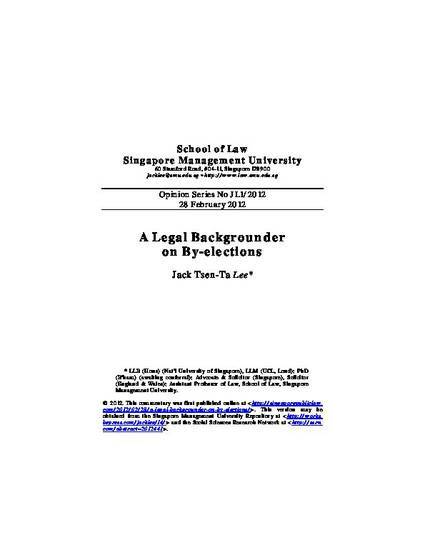 A Legal Backgrounder on By-elections. Singapore Management University School of Law Opinion Series No JL1/2012. Available at: http://works.bepress.com/jacklee/14.